Located 7000 light-years away, towards the constellation of Serpens (the Snake), the Eagle Nebula is a dazzling stellar nursery, a region of gas and dust where young stars are currently being formed and where a cluster of massive, hot stars, NGC 6611, has just been born. The powerful light and strong winds from these massive new arrivals are shaping light-year long pillars, seen in the image partly silhouetted against the bright background of the nebula. The nebula itself has a shape vaguely reminiscent of an eagle, with the central pillars being the “talons”. The star cluster was discovered by the Swiss astronomer, Jean Philippe Loys de Chéseaux, in 1745/46. It was independently rediscovered about twenty years later by the French comet hunter, Charles Messier, who included it as number 16 in his famous catalogue, and remarked that the stars were surrounded by a faint glow. The Eagle Nebula achieved iconic status in 1995, when its central pillars were depicted in a famous image obtained with the NASA/ESA Hubble Space Telescope. In 2001, ESO’s Very Large Telescope (VLT) captured another breathtaking image of the nebula in the near-infrared, giving astronomers a penetrating view through the obscuring dust, and clearly showing stars being formed in the pillars. The newly released image, obtained with the Wide-Field Imager camera attached to the MPG/ESO 2.2-metre telescope at La Silla, Chile, covers an area on the sky as large as the full Moon, and is about 15 times more extensive than the previous VLT image, and more than 200 times more extensive than the iconic Hubble visible-light image. The whole region around the pillars can now be seen in exquisite detail. The “Pillars of Creation” are in the middle of the image, with the cluster of young stars, NGC 6611, lying above and to the right. The “Spire”, another pillar captured by Hubble, is at the centre left of the image. Finger-like features protrude from the vast cloud wall of cold gas and dust, not unlike stalagmites rising from the floor of a cave. Inside the pillars, the gas is dense enough to collapse under its own weight, forming young stars. These light-year long columns of gas and dust are being simultaneously sculpted, illuminated and destroyed by the intense ultraviolet light from massive stars in NGC 6611, the adjacent young stellar cluster. Within a few million years, a mere blink of the universal eye, they will be gone forever. 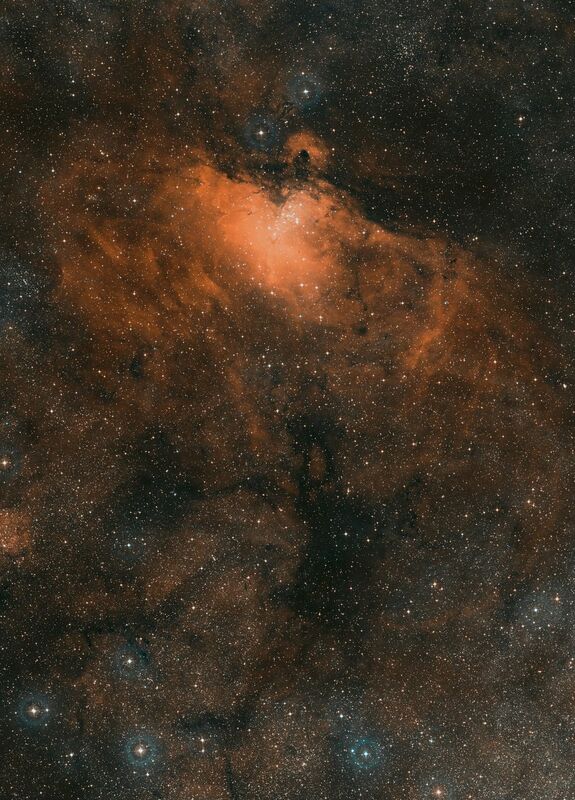 This image is a colour composite of the Eagle Nebula (M 16) made from exposures from the Digitized Sky Survey 2 (DSS2). 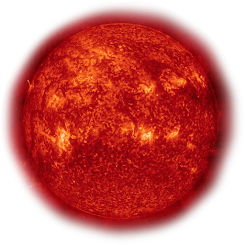 The field of view is approximatelly 3.8 x 3.3 degrees.